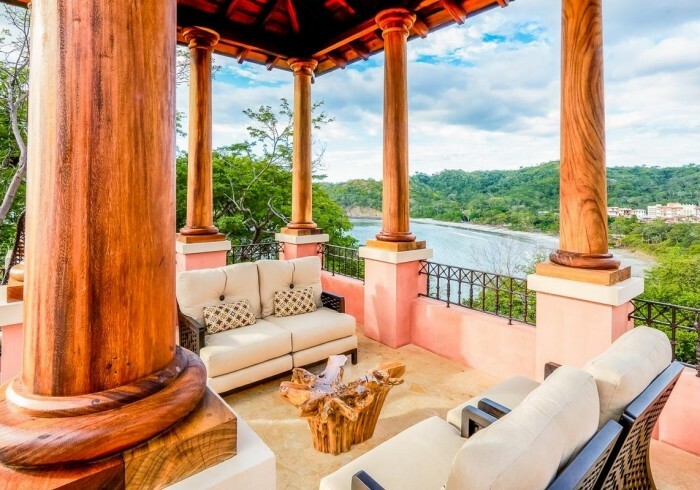 Casa Pacifica is a 5 bedroom, 5.5 bathroom home located on Punta Penca. This spacious home is able to accommodate up to 11 guests. It has a variety of living spaces available on all four levels including lots of outdoor space to enjoy the views and the warm weather. The home includes an elevator which makes this five-story home accessible for all as well as SONOS sound system! Both the large media room and den have access to the main patio, which includes an infinity pool and a dining area with built-in grill. The gourmet kitchen has beautiful ocean views as well as immediate access to the main patio and outdoor dining. The kitchen area also has a den that opens up to the terrace and outdoor sitting space. The master bedroom has a king-sized bed and sweeping ocean and hillside views. It also has three balconies, one of which sits among the trees, complete with a swing and marvelous bay views. It also has a walk in closet and a built in desk crafted from local Guanacaste wood. The master level includes two other bedrooms, each with a queen-sized bed they share a balcony overlooking the pool and the ocean. The lower level has two additional bedrooms. One of the bedrooms has a queen-size bed; the other is a “bunk room” that sleeps three. It also has a comfortable living room with a TV and a small refrigerator. A lovely patio, complete with a small fountain, is located off of this living room. The large roof top terrace is a wonderful space to enjoy a cocktail and watch the magnificent sunsets at Las Catalinas. Is comfortably furnished, including two hanging swings, a mini-bar area is located under the dramatic tower roof, with icemaker, small refrigerator and sink.